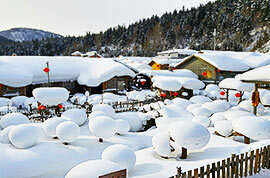 In the northeast area of China, a city called Harbin is renowned for its snow-covered landscapes in winter. With the unveiling of the grand Ice and Snow Festival held every year, visitors from different corners of the world come to admire the snow sculptures and ice lanterns, ski and participate in the various kinds of winter sports by taking Harbin tours. In addition to the ice and snow, do not forget to take a leisurely walk through the time-honored Central Street, taste Russian food in a baroque-styled building, feed pigeons at the square of St. Sophia Cathedral and stroll along the beautiful Songhua River. What is the best time to visit Harbin? The best season for a Harbin tour package is in winter, especially during the Ice and Snow Festival from January 5 to the end of February every year. However, serval theme parks that host ice and snow activities usually start earlier, which can be visited by the end of December. 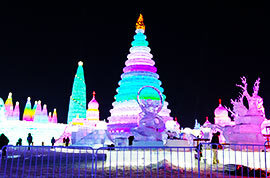 In order to keep away from the big crowds and excessive price increases, we kindly suggest you avoid to take Harbin ice festival tours on some holidays like Christmas (Dec. 24 - Dec. 26), New Year’s Day (Jan. 1 - Jan. 3) and the Spring Festival (Feb. 4, Feb. 10, 2019). Besides, due to the cool weather in July and August, planning a vacation package to Harbin in summer is also a good idea. It is really a very nice summer retreat. When will the Ice and Snow Festival be held in 2019? The Ice and Snow Festival in 2019 will be held from December 24, 2018 to February 28, 2019. What are the must see/things to do during the Ice and Snow Festival? Are there any other places you recommend? 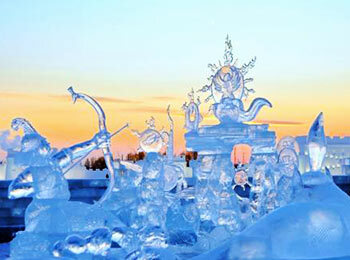 During the festival, you are highly recommended to visit Harbin Ice and Snow World - a "Snow Disneyland" built on Songhua River, appreciate the gorgeous Ice Sculptures in Sun Island Scenic Area or Stalin Park and attend the grand Ice Lantern Garden Party in Zhaolin Park. Furthermore, there are some other sites like St. Sophia Cathedral, Jile Temple and Siberian Tiger Park that are also worth visiting. How to get to Harbin? Taking flight is the fastest way to Harbin from most cities in China because of the convenient direct flights. To reach Harbin, it takes around 2 hours from Beijing, 3 hours from Xian or Shanghai and 4.5 hours from Guangzhou. 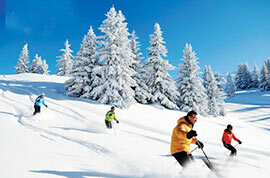 It is also convenient to plan a Harbin tour itinerary by train from some nearby cities like Beijing and Shanghai. If you take Harbin tours from Beijing, it takes around 10 hours by normal train and 7-8.5 hours by high-speed or bullet train. However, if you plan a train journey from Shanghai to Harbin, taking a normal train needs at least 24 hours and a high-speed train lasts 12.5 hours or so. Please check the following recommended train schedules for your reference. Is it cold in Harbin in winter? What kind of clothes to wear? Harbin is located in northeast China, effected by the cold air from Siberia, the weather of Harbin in winter is extremely cold and the temperature outside normally drops to -25°C (-13°F) to -10°C (14°F). Therefore, it is necessary to dress warmly and bring thermal underwear, wool sweaters, down jacket, gloves, hats, scarfs, earmuffs and snow boots when you take a Harbin China tour in winter. However, if you stay indoors, a sweater plus a pair of warm pants are enough as there is heating available. 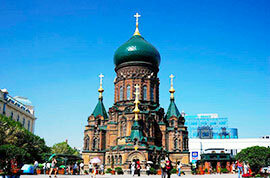 In Spring, I recommend you to visit Sun Island Scenic Area, Harbin Polarland, St. Sophia Cathedral, Central Street and Jile Temple in Harbin. However, Harbin is famous for ice sculptures in winter so that I would like to suggest you visit Yabuli International Ski Resort as well as Harbin Ice and Snow World in winter. 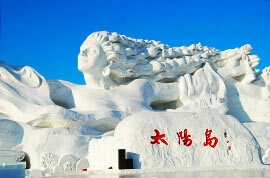 Besides, it is also good to join in Harbin Ice and Snow Festival as well as Ice Lantern Garden Party. 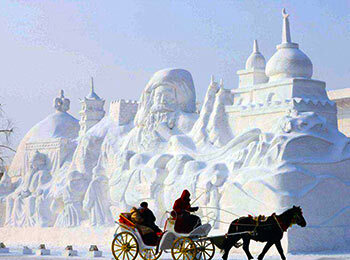 The best time to visit Harbin is in winter. However, summer is also a good time to visit due to the pleasant weather and beautiful natural scenery. The recommended places to visit are Central Street, St. Sophia Cathedral, Sun Island Scenic Area, Harbin Polarland, Siberian Tiger Park, Provincial Museum, etc. Besides, you can also walk along the Songhua River to look at the local people's life and enjoy the scenery. How do i go to sun island and ice and snow world from sofitel harbin? Is it advisable to do it on a single day? The two places can be visited within a day. Walk southwest for 3 minutes to Xiangfang Wanda Guangchang bus stop to take bus 17 and then transfer to bus 127 at Fushunjie. Get off at Bingxue Dashijie (Ice and Snow World). Then, you can take a taxi to Sun Island within 10 minutes. Will be in Harbin from 9 to 20 April 2018. Appreciate your recommendation please. Thank you. You are suggested to live Central Avenue, where you can go to local attractions conveniently. Hotels like Hanting Hotel in 27 Xishidao Street, Tingxiang Holidat Inn in 6 Hongxia Street and Xilong Hotel in 41 Xiwudao Street are recommended. As for local foods, you can try braised pork with vermicelli, dumplings, and sausages. To travels around, you can walk east for 10 minutes to Zhaolin Park; take bus 126 to Ice & Snow World; take Fanghong Jinian Ta – Taiyangdao Bus Line to Sun Island Scenic Area; take a taxi to Volga Manor. Besides, you are also suggested to pay a visit to some further attractions, like Changbaishan Mountain, or a tour to Beijing is also great!